Another great week. It’s great to look back in pictures in our life. One thing to note that I don’t think we memory keepers/family historians rarely do is that we most often capture the fun and good in our lives. The fussing and fighting and angry faces rarely make an appearance in our scrapbooks. It can leave viewers wondering why their life isn’t always so happy. So have no fear, we are not perfect and we have tough moments in our lives too. 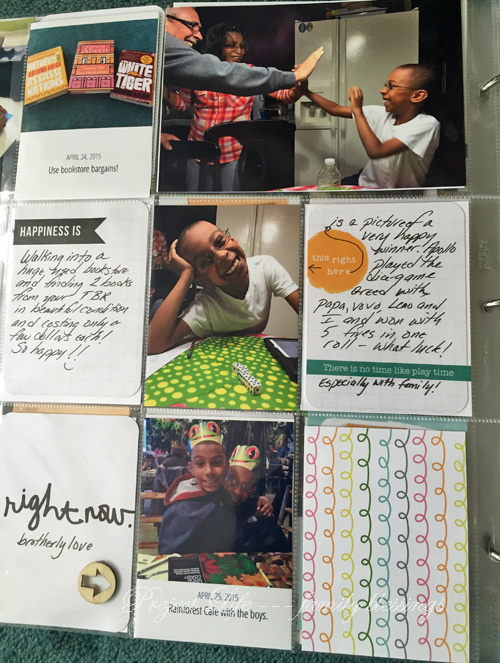 However, I treat my scrapbooks like my visual gratitude journal. I try to capture the things that give me joy. I like this process because it helps me to slow down and find good not just in the extravagant but the ordinary. So when I start off saying another great week, it was not without hiccups but overall I am forever grateful for the time. Now, onto week 16, I liked this title card because I simply had to add the numbers and the word April to make it work. I used this cute wooden embellishment for the photo I took of the lake I walk. I love how you can still see the lake through the letters in it. Very cool. The weather finally warmed enough for me to start taking the boys to the playground again. So Apollo took the opportunity to play on this spinning wheel. I don’t know what they call it. Do you? I always think back to my hamster Hamilton I had growing up and watching him run in his wheel. I also captured them sitting on the deck steps soaking in a little sun. Nicholas loves his comics and one day he lined up Apollo’s stuffed animals and put the corresponding hats on them and lined them up on the couch to look like Huey, Dewey and Louie! Of course I also captured my dinner at the Yardhouse. A new favorite dinner for me. 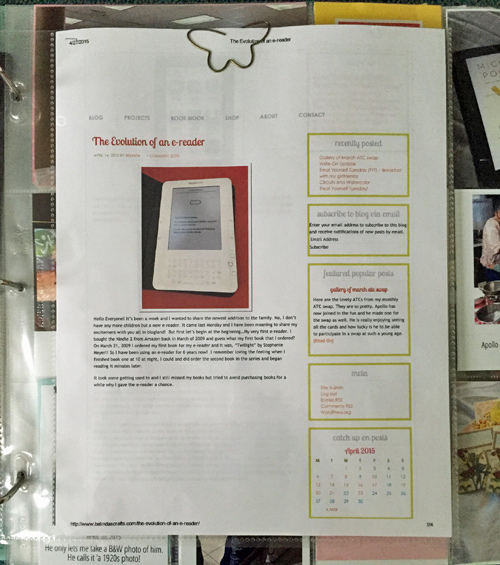 My insert this week was a print out from a blog post talking about my evolution of my e-readers. I figured, why reinvent the wheel when I don’t have to? I attached the packaging for my newest tablet/e-reader – Kindle HD Tablet to the back of this insert. It will be fun to look back 5 years from now at what was the “cool” technology we had. 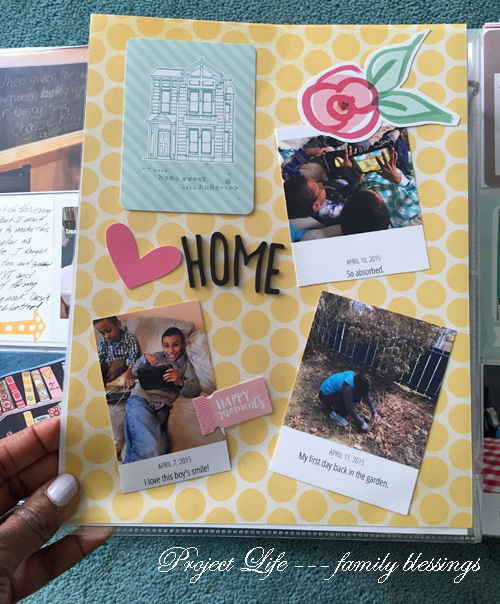 I included pictures from my day-long crop with my crafty gal pals. It’s always so much fun. I can’t go back until the fall because from this point forward, my weekends are dedicated to family. But when I go, I love the talk, the crafting and the food we all bring – yummy! This time around my first book I downloaded on my Kindle is a book about cooking. Not really a cookbook but a book about how our habits around food and cooking have changed over the past 50 years. I find it fascinating and it is helping me to redefine my own habits. I included a picture from my Zumba video. I have been doing pretty good incorporating it into my workouts. Rarely does Nicholas smile for my pictures so I was all over this one and processed it in black and white. We visit my in-laws most Sundays and on this week, I had music playing and it was so great to see Vovo and Nicholas dance and then Apollo danced with her too. It’s a great memory for us all. They are blessed to have able-bodied grandparents that can play and dance with them. I never take that for granted. 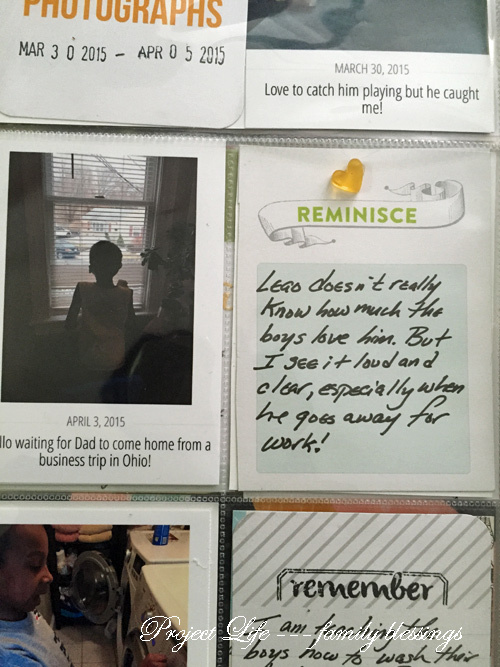 Especially since both of my parents have passed on, I try to ensure our boys spend lots of time with Leao’s parents. Great week. I’ll see you next week with Week 17. Hello! Happy Monday! I am back. I have been struggling to get back to some semblance of a schedule but this time of year, I just try to stay afloat. This past weekend I was working with Nicholas on his science project for science fair. I love when I can use my Silhouette on one of his projects. But I did manage to squeeze in a Project Life session with my friend Ashley on Saturday. Ok, enough babbling and on to week 15, shall we? 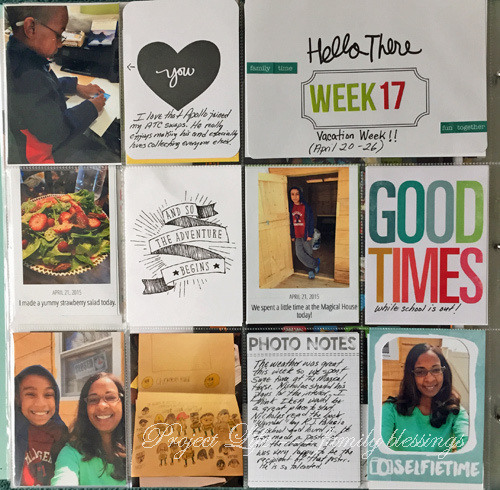 This week I had a lot focused around my other love – reading. I ended up with an insert to hold a little extra. 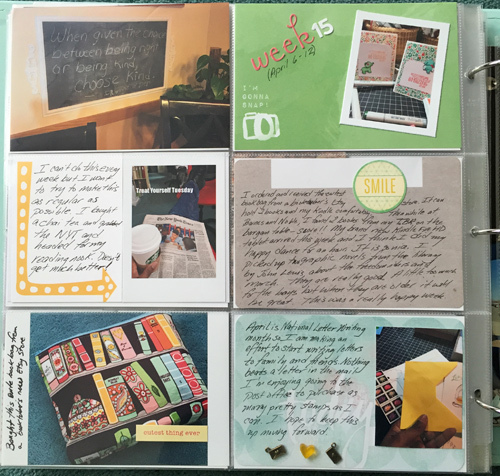 Keeping the number of photos down is challenging for me since this is pretty much the only scrapbook I work on for the year. I don’t want to leave things out. The first page has a picture of our Words of Wisdom chalkboard in our kitchen. I usually put a quote or poem and Nicholas also contributes. When it is a quote we all memorize it and recite it to each other without looking. I make it fun while sneaking in some education. I also made two cards with my new elephant stamps from WPlus9. Treat yourself Tuesday was something I made up for myself to have a time during the day for reflection and relaxation. So that Tuesday, I got my Chai and the NYT and headed for my reading nook. So nice to take that time to myself. No work,laundry nothing but me, my paper connecting me to the world happenings and the serenity of sipping hot tea. Pure bliss!! 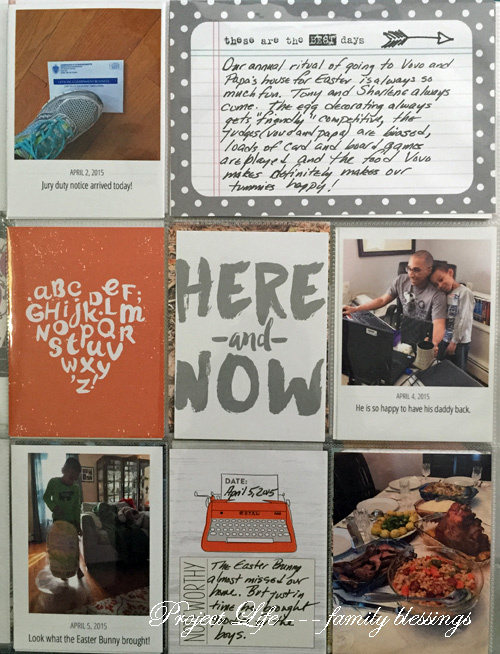 I also included a photo of my letter writing challenge. I have still continued with it but not on that scale. I have a little bin with all of my pretty card sets, stamps and addresses, so I can start whenever. Makes it easier for me to do it. And I took a picture of my new book bag that I ordered on Etsy. Lovin it!!!! The insert this time was directly from a blog post. I printed it and included it in an 8 1/2 x 11 page protector. 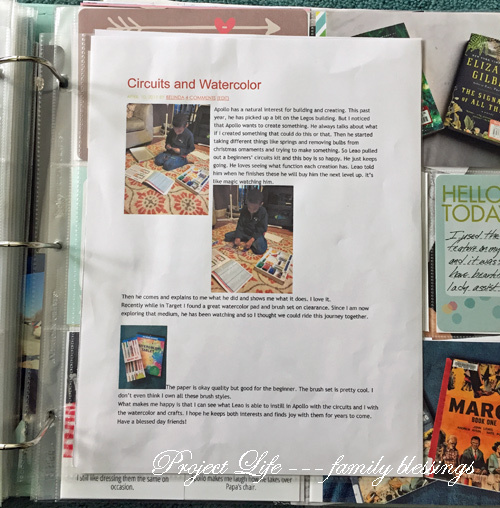 It saved me a lot of time and I loved the information about Apollo with his circuits and watercolor set. On the back side of the insert, I included pattern paper and some embellies along with a 3×4 card acting as part of the title of the insert. Since all those photos happened at home, I wanted to show our love for our home. The last page shared a great book haul as well as my first graphic novels I got from the library that focus on the civil rights movement. I also included a photo of a cute happy mail I received from Birchbox that addressed me as Delightful Belinda. Great marketing I tell you. I also included a photo of me using MayDay for the first time with my Kindle. I think this such a cool feature. Instead of talking on the phone, I talk through my device and the technical consultant can actually take control of my screen if necessary to help me. And I liked that it was lovely brown lady that was my first helper. Overall, a great week and I am glad I documented it for us to look back on. I will be back next week with week 16. Hope you all are well. I’m back!! 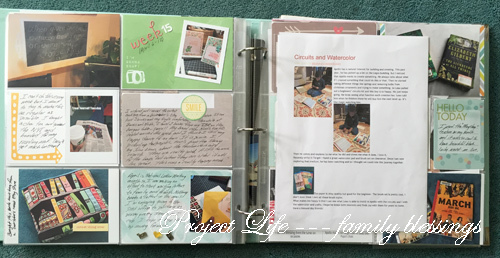 I have been swallowed up by life and many projects got put on the back burner, project life being one of them. 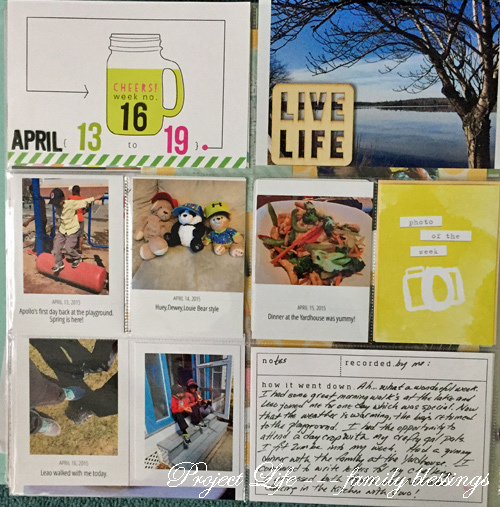 So I’m climbing my way back out of the whole and I am now able to bring you week 14 of my Project Life which was a busy but fun week. 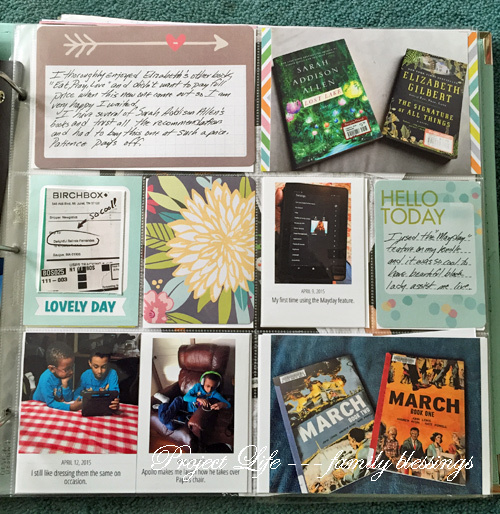 I of course ended up cutting a page protector to make an insert to accommodate my problem of wanting to include way too many photos. I included my current book club read at the time which was The Invention of Wings by Sue Monk Kidd. That was the first book by that author that I read but I thoroughly enjoyed it and even recommended to a friend who also read and enjoyed it. You can read my review here. 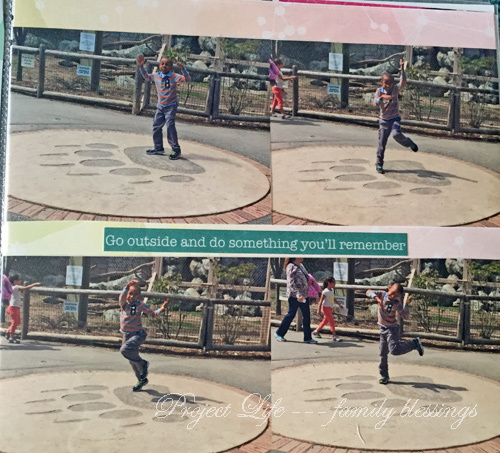 I took a few candid photos of Apollo and I included my March design for my ATC swap. I love the photo I included of Apollo waiting at the window for Leao to return via taxi from a business trip. It is one of those moments that made my heart so happy. I think I realize how much they love their dad because I witness these type of moments. I actually sent the photo to Leao while he was riding home in the taxi to show him how much he was missed. Just precious. 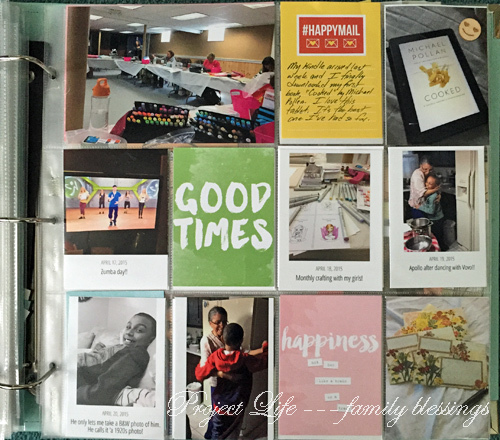 For the insert I cut a 12 x 12 page protector down to include more photos. 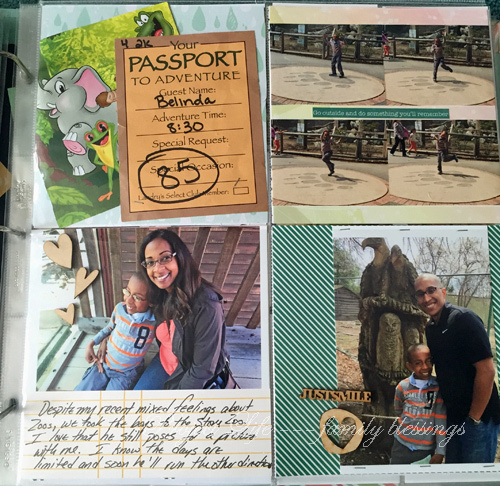 I do this because I want my inserts to be smaller than the regular 12 x 12 page protector. It included a candid of Apollo in Barnes and Noble. They still love this place and so we go quite regularly. 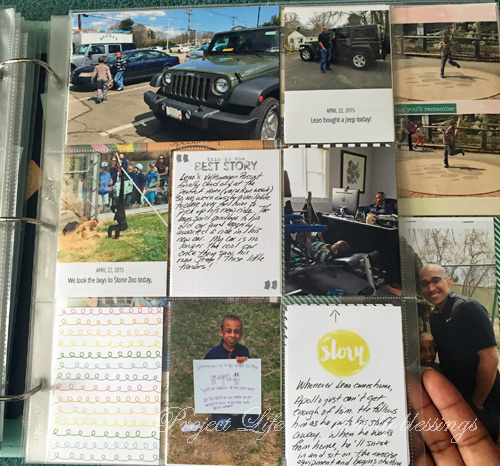 I also included and journaled about Apollo and how much joy he has for being a part of my monthly ATC swap. I took a picture of him sorting the cards in preparation for mailings. 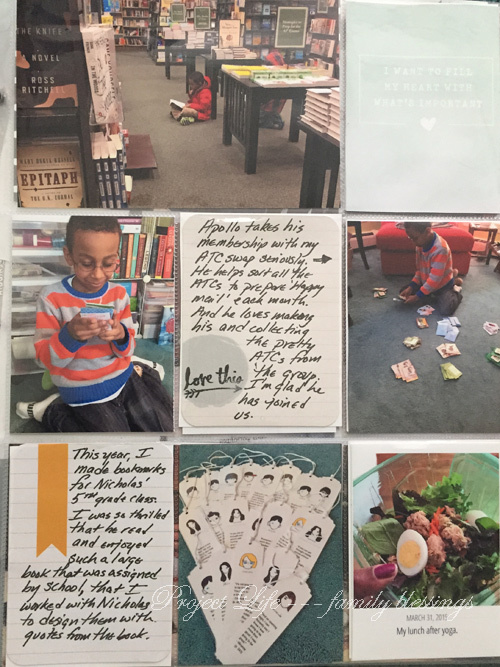 I also included bookmarks I made for Nicholas’ class since they read, “Wonder”, I made custom “Wonder” bookmarks. This is the back side of the insert. I included the photo of the day I received my jury duty notice. I mean come on, why me? I have been called to jury duty since I was in college (which is a while back now) and I still meet people that have never been called. What? Not fair!! I also included Apollo on Easter morning getting his basket and a picture of the yummy spread my mother-in-law made for Easter Dinner. 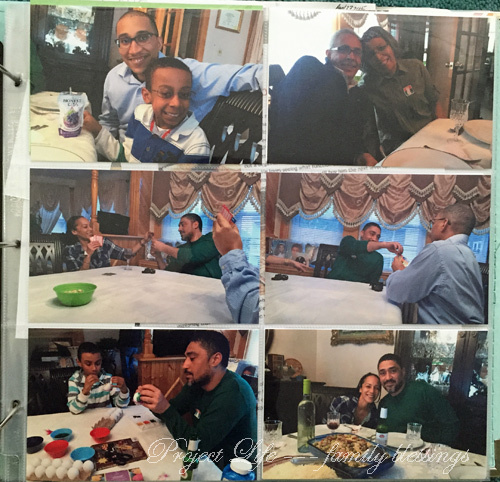 I just included photos on the second page from Easter with family. I didn’t put any embellishments on this page because my goal was to get it documented and complete. So I hope to keep climbing out of this whole so that I can return next week with week 15. Happy memory keeping my friends!